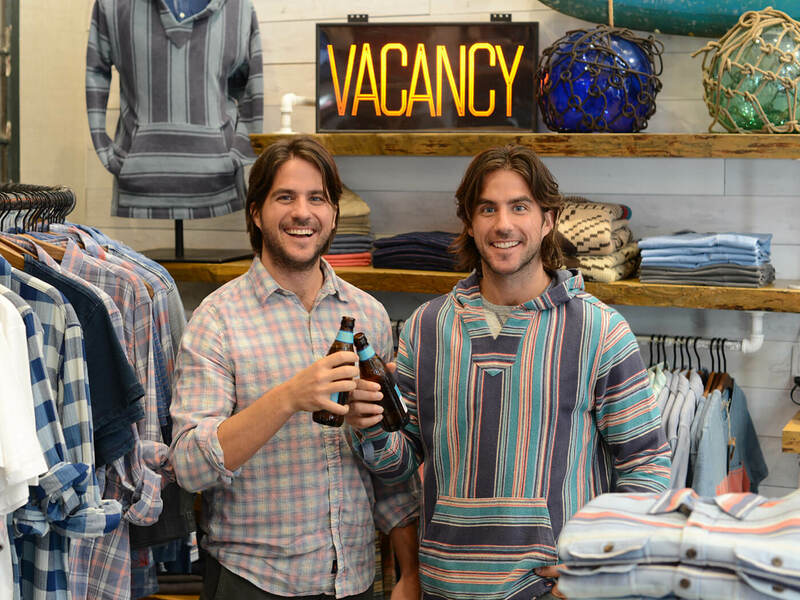 Meet Mike and Alex Faherty, the twin-brother mavericks behind Faherty Brand—now bringing elevated, surf-inspired menswear to Stitch Fix Men. When this duo noticed it was hard to find casual styles in high-quality fabrics in stores, they decided to launch their own brand—and have since amassed a worldwide cult following! We caught up with these New Jersey natives to learn more about their story, surf skills and their personal fashion icon: their dad. What motivated you to start Faherty? Mike: “I was a kid who lived and breathed buying clothes at the surf shop. I remember all of a sudden, as a teenager, I was like, ‘Nothing here feels good enough anymore. I almost don’t want to buy it.’ It was my vibe, but I didn’t necessarily feel the quality. The other thing that inspired me; my dad had great style. I remember going to his closet and feeling his shirts and his ties, and starting to learn a little bit about the tactile experience of what nice clothes are. And this is all at a pretty early age, maybe 10, 12 years old. Tell us about your surfing lifestyle and how that’s influenced the brand’s look and feel. Alright, time to get serious. Who’s the better surfer? Any words of wisdom from over the years that you’d like to share with our readers? What are some of the coolest—and most annoying—things about working with your brother? Alex: “There’s an ultimate trust level that we want to get the same thing out of this business. So we’re always aligned on the vision of the brand. Because of that, there’s really never fights about anything. It’s a mutual understanding. This is what we’ve always wanted to do. And when you do it with someone you’ve spent your whole life with, who’s your closest friend, it just makes that so much easier and makes it so much more fulfilling. I was really blown away by just how hands-on you guys are with the design and the manufacturing. Why do you think it’s so important to be transparent and remain innovative? Alex: “Faherty’s something we did because it was a passion of Mike’s. Designing clothes is his favorite thing to do in the whole entire world, since he was 18 years old. We think about the world in a different way than other companies, or maybe larger corporations, think about. For us, it’s about how great a product we can make because it’s something we’re proud of. We’ve always been interested in sustainable technology, as far as when we were thinking about starting this brand. For someone who is new to Faherty Brand, what are your three favorite essentials? One of the things that’s become a big part of our spring and summer business is indigo-dyed knitwear. It’s blue―guys love blue―so we’ve developed this really big line of short-sleeved T-shirts and polo shirts that are dyed with indigo. We’re doing different stripe patterns and all sorts of different color combinations. Think fast. Tell us one thing about each other that no one would ever know. Ready to try Faherty? Ask your Stylist for looks from our newest brand―including their popular shorts, swimwear, wovens and knits―in your next Fix.